Bijou - A gem of a little salon in Skaneateles: Very important information! My good friend Shelly (my fairy godmother in decorating Bijou) is having an old fashioned tag sale at her studio! 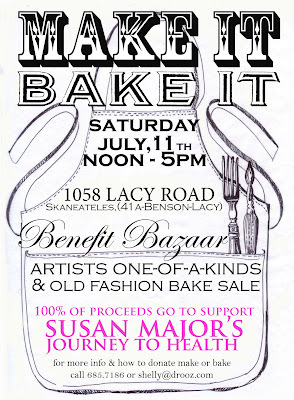 You should make it a point to come down, there will be so many goodies...She has amazing connections and the whole community is pulling together for some really cool and affordable priced gems! (Plus I just read, there will be a psychic there, how fun!!!) 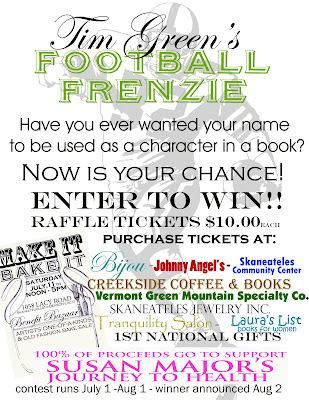 THE FLIP FLOPS AND RAFFLE TICKETS WILL BE SOLD AT THIS EVENT! Susan Major always has a smile on her face, with lipstick that typically coordinates with her outfit; but it's her inner beauty that radiates. Founder of Sacred Mornings for Moms and Our Joyful Journeys, Susan has ignited many women to believe in a better day, nourish their spiritual side and to think about giving back to others. I have witnessed firsthand Susan's ability to sow seeds of hope for others. Many women have stopped me with tears in their eyes to tell me how Susan has positively impacted their life; now that circle of love that she creates is the ripple in the pond that we all feel. At age 39, Susan was recently diagnosed with stage 3 breast cancer That's why the community is coming together, especially Bijou Salon, www.bijousalon.net to help raise awareness. 100% of the proceeds of every flip flop purchase will directly support Susan in her road to better health. Flips are stylish, various sizes and inscribed with words "Love, Faith and Hope".